To Wax Poetic is to grow more expansive or expressive lyrically. Growth and transformation is inherent in the verb to wax, and in the creative or poetic process itself. Each of the six New York based artists in this exhibition has created a symbolic language, or aesthetic, using encaustic paint. 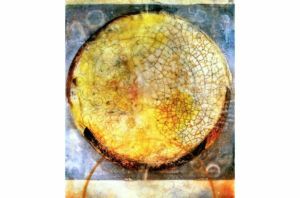 Encaustic is the ancient medium of bees wax, resin and pigment, applied while molten. Curated by Katharine Dufault, each artist has a number of works selected to demonstrate the breadth of their vision. Gene Kiegel builds up a highly textured surface in his monochromatic works. “The wax’s organic nature lends itself to the generation and simulation of organic forms and phenomena” which are both alien and familiar. Kiegel wants to show what is “beneath our hyper-stimulation and oversaturated reality.” He employs the ‘dry-brush’ method – waiting for each brush of molten wax to cool slightly before application. Melissa Rubins builds up layers of colored wax, transfers and fine etching to create the lyrical and ancient looking works of her ’Fragments’ series. The “series is directly inspired by the shards of ceramics and pottery” found washed up on the beach near her Long Beach studio.